After a relatively sedate Tet1 Eve - save for the Sturgis-esq2 mass exit of motorbikes from the main part of town - it was time to lower our noses to a more acceptable level and wave an “au revoir” to our newest Vietnamese acquaintance, Da Lat. Not that leaving was a minor task. Tet is a great time to travel in Vietnam but you need to heap on a few extra helpings of patience, wads of dong and a bit of luck. Just the night before we spent a few hectic hours scrambling for and eventually booking the last stagecoach out of Dodge. The bus company even swore to pick us up at our hotel doorstep, bright-eyed and bushy tailed at 8 o’clock. Just to set the stage a bit, Da Lat is perched in the Vietnamese highlands, mountainous and cool, whereas our next destination, Nha Trang hugs the scorching Vietnamese coast six hours away. Now how does one get from mountains to coast? Why, come down the mountain of course. That means a bus ride weaving down through the mountains. Emphasis on weaving. Weaving wouldn’t present so much of a challenge except for the fact that one traveling companion was on the tail end of a cheery little “stomach thing” and the other rolls over in bed an hour before our bus to Nha Trang arrives and mentions he’s feeling a bit funny. Thirty minutes later he has spent the last twenty in the bathroom, his 6-foot plus frame doubled over. Fifteen minutes until our ride he is curled up in bed, bags unpacked and not the slightest intention of the world of ever leaving Da Lat alive. It’s beginning to look like Da Lat has claimed its first victim. By some miracle we are curbside - all three of us, some looking better than others - ready for the ride. Sputtering up the hill amid the sounds of gnashing gears and a racing engine chugs a small green vehicle. A small green mini-van, rather common in Asia and what I would call a mienbao che, literally “bread car.” Think a small loaf of wheat-bread on 4 wheels, rounded on both ends and rather top heavy, perfect for our climb down the steep roads. All three of us feel our stomachs sink, especially the most infirm of the group, not only for his new ailment but for realizing his knees will be snuggly nestled beside his ears for the next six hours. We pile in and proceed to pick up 4 more people. We go racing down through the center of town and up the next hill where we catch a glimpse of a slightly larger van - the replacement. Grinning and feeling quite lucky our ride isn’t the current van, we move our bags over to the bigger bus and settle in. Our driver must feel compelled to make some sort of deadline and he throws us down the mountain with abandon. We straddle the middle line for the straight-aways and dip into the oncoming lane turn after turn. The horn warbles constantly, urging hordes of motorbikes and smaller cars to the shoulder, tearing past them. Only upon hearing louder, more menacing horns do we cede any pavement, swinging right to avoid tractor trailers and large tour buses at the last second. Feeling slightly unsettled myself after only 10 minutes of this I look back expecting the worst. Four bodies crammed into the bench seat. One Vietnamese girl looking rather green, her two friends trying to both comfort her and stay out of the path of what might will soon come, and one tall American, crammed ever so artfully into the small seat, face pale and head bouncing pathetically on the window. Uh oh. The next 2 hours are spent screeching tires though hair-pin turns and listening to sad wretching noises. At a well timed stop to change drivers - the old one must have started feeling queasy - I hear a mad scramble from behind me. The three Vietnamese are staring, fixated on their seat mate. They know a tempest brewing when they see it and they watch with horrid fascination as he vainly shakes the window latch. Whether due to panic-rattled fingers, child-proofing or malfunction the window doesn’t open. This establishes a sense of urgency and the next thing I know he is crowd surfing his way over the Vietnamese, snaking past me and to the sliding van door. I decide this would be an appropriate time to be a decent friend. However any good intentions of mine are rendered useless, I’m paralyzed with laughter. Having just watched somebody, deep in the grip of panic, crawl over 5 people in a ridiculously small bus in a frantic attempt to reach the door before bursting, I can’t do much else. Arriving at the the door, he gives the handle a solid tug. Another tug - more urgent this time. With eyes wide, he delivers a crazed rattle to the door. The driver, listening to a now constant shaking of the door and low whimpering noise and finally aware that something may be amiss, slowly swings open his door and casually walks around the back of the van. With an almost practiced nonchalance he slide the door open and watches as the caged green Westerner shoots out the door and makes it barely two steps before depositing breakfast on the dusty shoulder. What fun, the bus rides in Vietnam. Nha Trang welcomes us. More specifically it welcomes our Western dollars. In fact everything has two prices. A nice small round number for all the brain-dead Americans. Five dollars. Ten dollars. Twenty dollars. And a much larger number for the rest. Eight thousand dong. Forty thousand dong. One hundred and seventy-five thousand dong. I’ll gladly take the six-figure prices - especially at 15,000 dong to the dollar. Nha Trang is a pretty typical beach town - bursting at the seams with construction by the waterfront and drunk with the influx of foreign cash - it has the rowdy foreigner bars and vast stretches of sand piled high with beached pudgy white bodies. Not so scenic. 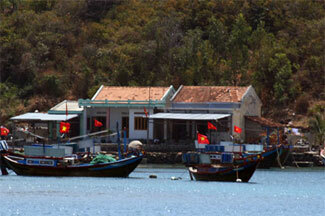 We take an early morning boat away from this scrum to see the underwater side of Vietnam. Talking with the sun-leathered captain on the cruise out I hear a sad - yet familiar story. The story starts out easily enough - our favorite seafood - me drooling over the thought of a nice, rare tuna steak and my captain friend thinking of fresh oysters. I ask about fishing and he gives a wry laugh. Looking down into the vertigo-instilling water, I can see 20 meters to the bottom. Clear. Beautifully crystal clear and dead. He opens a small tattered guide book to reef life. Next to each picture a small penciled in date. 2005. 2002. 1997. Each the last time he saw the creature. Thumbing though the pages I realize there are more pictures with dates than without. He sets the book down with a sad resignation and cuts the engine as we pull up tight to a small island. Dipping into the water I see hundreds of trigger-fish gnawing on the coral, angel-fish darting in and out of the coral fronds and legions of jellyfish hugging the surface. Although the reef teems with life our captain is right, something is missing. After 2 hours underwater three barracuda slice by, not much bigger than my forearm. Those small barracuda are now the apex predators - except for us. Shooting Cosmic Marbles - The things you don’t think about in space can kill you. Ejecta from martian meteorites lands at almost the same velocity as when the started. Toss It! - As much as I want to do this I just don’t have a brass set. Color Theory - The way colors make us react - and the way that is changing. Injecting the Right Way - SQL injection cheatsheet. Don’t Use Your Back - Three necessary words. High voltage. Anti-gravity. Superbowl Shenanigans - $40,000 later he had plugged his new book… real or real fake? Olive Oil! - A brief history.